Length adjusts from 13" to 17". High strike offset. Slotted holes for easy adjustment. For wood or metal doors. Includes screws. Replacement jamb bracket for use with "Wright Products" Storm & Screen Door Closers (V820, SKU 164.5126, 548.9406), (V920, SKU N/A), (V1020, SKU 683.5631, 683.5706, 698.2185), and (VH440, SKU 639.7236, 683.6225). Replacement jamb bracket for use with "Wright Products" Storm & Screen Door Closers (V820, SKU 164.5126, 548.9406), (V920, SKU N/A), (V1020, SKU 683.5631, 683.5706, 698.2185), and (VH440, SKU 639.7236, 683.6225). Use on screen or storm doors for positive closing action. Steel construction with zinc finish. Polybagged. Use on screen or storm doors for positive closing action. Steel construction with zinc finish. Polybagged. Protects door and closer from wind damage. Includes wind chain and hold-up spring to prevent chain from hitting door and scratching glass. Mounting brackets and screws also included. Die cast & steel rod. Visual-pack. Die cast & steel rod. Visual-pack. Die cast & steel rod. Visual-pack. Use on screen or storm doors for positive closing action. Steel construction with zinc finish. Polybagged. Protects doors from wind damage. Hold up spring prevents chain from hitting door and scratching glass. Looped ends for easy installation. Four diameter sizes for various applications. Designed for doors and lightweight gates. Steel wire spring. Visual-pack. Heavy steel with extruded bearing in housing and rocker arm - assures smooth action. Includes screws. Designed to absorb shock, preventing wind damage to screen and storm doors and closers. Visual-pack. Looped ends for easy installation. Four diameter sizes for various applications. Designed for doors and lightweight gates. Steel wire spring. Visual-pack. Moveable latch for solid strike keeper. 1-3/4" hole centers. Adjustable; heat treated; high tension steel spring; used by several glass/screen door manufacturers. Roller Edge Type: Concave. Steel roller ideal for coastal environments; resists rust and corrosion. Stamped aluminum corner; adjusting screw; 1" nylon center grooved wheel; used by Jim Walters. Use to move light to medium weight furniture. Black rubber wheel. Surface mount - no mortising required. Pin taps out for easy door removal. Holes are countersunk on both sides. Manufactured from cold-rolled steel. Moveable latch for solid strike keeper. 1-3/4" hole centers. Kit is designed to replace damaged door closer brackets. Kit contains: 1-Jamb bracket, 1-Door bracket, 4-Long screws, 4-short screws, and 2-attachment pins. Door closer NOT included. Visual-pack. Flap has tear strips to adjust width from 3/4" to 1-3/8". Flexible, seals against insects. Standard inside latch for all pushbutton and pull handles. Mounts with solid strike SK2 (included). Designed to hold screen and storm doors shut. Closing action of door engages catch and releases strong steel spring. Spring tension closes door and holds it in shut position. Steel frame and spring with rubber roller. Steel rod with aluminum body. Visual-pack. Screen door corner assembly with center groove nylon roller; adjustable tension. Used by Acorn Industries. For out swing wood or metal doors 3/4 inch to 1-1/8 inch thick, installs in 1-1/2 inch , 1-3/4 inch or 3 inch hole spacing, all installation hardware included. For out swing wood or metal doors 3/4 inch to 1-1/8 inch thick, installs in 1-1/2 inch , 1-3/4 inch or 3 inch hole spacing, all installation hardware included. For outswinging wood or metal doors. Fit doors 1" to 1-1/4" thick. Installs in three 5/16" holes. Contains two sizes of strikes and shims to provide adjustment for latching. Has "No Lock Out" feature to prevent accidental lock out. 1-3/4" installation hole spacing. Authentic colonial hammered finish. For outswinging wood or metal doors. Fit doors 3/4" to 1-1/4" thick. Installs in three 5/16" holes. Contains two sizes of strikes and shims to provide adjustment for varying backsets. Has "No Lock Out" feature to prevent accidental lock out. 1-3/4" installation hole spacing. For outswinging wood or metal doors. Fit doors 1" to 1-1/4" thick. Installs in three 5/16" holes. Contains two sizes of strikes and shims to provide adjustment for latching. Has "No Lock Out" feature to prevent accidental lock out. 1-3/4" installation hole spacing. Tight pin hinge with the enclosed spring is for left or right mount applications. Designed for full surface applications. Set includes: 1 pair #122 spring hinges, 1 - #2 hook and eye, and 1 - #2 pull. Steel hinges, hooks, eyes, and pull. Visual-pack. For lightweight storm doors and wood doors. Full 90 degree opening. Two hole end plug for summer or winter. Adjustable latching power and closing speed. Factory lubricated. Visual pack. For lightweight storm doors and wood doors. Full 90 degree opening. Two hole end plug for summer or winter. Adjustable latching power and closing speed. Factory lubricated. Visual pack. For lightweight storm doors and wood doors. Full 90 degree opening. Two hole end plug for summer or winter. Adjustable latching power and closing speed. Factory lubricated. Visual pack. For wood or metal doors, for outswinging doors. Full 90 degree opening. Two hole end plug for summer or winter adjustable latching power. Adjustable closing speed. Factory lubricated. For wood or metal doors, for outswinging doors. Full 90 degree opening. Two hole end plug for summer or winter adjustable latching power. Adjustable closing speed. Factory lubricated. For wood or metal doors, for outswinging doors. Full 90 degree opening. Two hole end plug for summer or winter adjustable latching power. Adjustable closing speed. Factory lubricated. Internal spring for prevention of rod bending. For wood or metal doors, for outswinging doors. Full 90 degree opening. Two hole end plug for summer or winter adjustable latching power. Adjustable closing speed. Factory lubricated. Internal spring for prevention of rod bending. For wood or metal doors, for outswinging doors. Full 90 degree opening. Two hole end plug for summer or winter adjustable latching power. Adjustable closing speed. Factory lubricated. For wood or metal doors, for outswinging doors. Full 90 degree opening. Two hole end plug for summer or winter adjustable latching power. Adjustable closing speed. Factory lubricated. Internal spring for prevention of rod bending. Spring loaded, steel housing with top adjusting screw; used by Bay-Mills and other door manufacturers. Roller Edge Type: Concave. For outswinging wood or metal doors. Fit doors 1" to 1-1/4" thick. Installs in three 5/16" holes. Contains two sizes of strikes and shims to provide adjustment for latching. Has "No Lock Out" feature to prevent accidental lock out. 1-3/4" installation hole spacing. Authentic colonial hammered finish. For outswinging wood or metal doors. Fits doors 1" to 1-1/4" thick. Installs in three 5/16" holes. Contains two sizes of strikes and shims to provide adjustment for latching. Has "No Lock Out" feature to prevent accidental lock out. 1-3/4" installation hole spacing. For wood or metal doors, for outswinging doors 7/8" to 1-3/8" thick. Install with 1" diameter hole, no mortising. Backset 13/16" from jamb (door stop). Pull to open from outside, push to open from inside. All installation hardware included. Automatic hold open feature. Visual-pack. Automatic hold open feature. Visual-pack. Tight pin hinge with the enclosed spring is for left or right mount applications. Designed for full surface applications. Set includes: 1 pair #122 spring hinges, 1 - #2 hook and eye, and 1 - #2 pull. Steel hinges, hooks, eyes, and pull. Visual-pack. Automatic hold open feature. Visual-pack. For outward swinging wood or metal doors 1" to 1-1/4" thick. Contains 2 sizes of strikes and shims to provide adjustment for latching. Has "No Lock Out" feature to prevent accidental lock out. 1-1/2" installation hole spacing. For outward swinging wood or metal doors 1" to 1-1/4" thick. Contains 2 sizes of strikes and shims to provide adjustment for latching. Has "No Lock Out" feature to prevent accidental lock out. 1-1/2" installation hole spacing. For outswinging wood or metal doors 3/4" - 2" thick. 1-3/4" mounting hole spacing. Replaces most standard push button latches. Has "No Lock Out" feature to prevent accidental lock out. All installation hardware included. For outswinging wood or metal doors 3/4" - 2" thick. 1-3/4" mounting hole spacing. Replaces most standard push button latches. Has "No Lock Out" feature to prevent accidental lock out. All installation hardware included. Adjustable steel housing; steel ball bearing wheel fits on doors by Peachtree. Includes 2 roller assemblies and installation screws. For all outward swinging doors 1" to 2" thick. Mounts 1-3/4" center to center. No lockout latch, solid strike. Converts to lock with SK8. For all outward swinging doors 1" to 2" thick. Mounts 1-3/4" center to center. No lockout latch, solid strike. Converts to lock with SK8. Designed for wood or metal screen and storm doors 1-3/4" hole spacing. Fits wood doors from 5/8" to 2" thick. Interior locking mechanism provides for enhanced security. Mounting screws included to match product finish. Includes spring loaded strike plate. Note: for 2" thick doors, pan head machine screws 8/32" x 2-3/8" are required and must be purchased separately (qty 2). Visual-pack. Designed for wood or metal screen and storm doors 1-3/4? hole spacing. Fits wood doors from 5/8" to 2" thick. Interior locking mechanism provides for enhanced security. Mounting screws included to match product finish. Includes spring loaded strike plate. Note: for 2? thick doors, pan head machine screws 8/32? x 2-3/8? are required and must be purchased separately (qty 2). Visual-pack. Designed for wood or metal screen and storm doors 1-3/4? hole spacing. Fits wood doors from 5/8" to 2" thick. Interior locking mechanism provides for enhanced security. Mounting screws included to match product finish. Includes spring loaded strike plate. Note: for 2? thick doors, pan head machine screws 8/32? x 2-3/8? are required and must be purchased separately (qty 2). Visual-pack. Designed for wood or metal screen and storm doors 1-3/4? hole spacing. Fits wood doors from 5/8" to 2" thick. Note: for 2? thick doors, pan head machine screws 8/32? x 2-3/8? are required and must be purchased separately (qty 2). Interior locking mechanism provides for enhanced security. Mounting screws included to match product finish. Includes spring loaded strike plate. Manufactured from zinc die-cast. Alum tube - steel rod, steel jamb and steel door brackets. Dsigned for use on out swinging wood or metal doors up to 1-3/8? thick. Door closing speed is fully adjustable. Two hole end plug allows closing force to be regulated. Includes convenient "hold-open" washer. Extended operating life as closer is permanently lubricated. Visual-pack. Alum tube - steel rod, steel jamb and steel door brackets. Dsigned for use on out swinging wood or metal doors up to 1-3/8? thick. Door closing speed is fully adjustable. Two hole end plug allows closing force to be regulated. Includes convenient "hold-open" washer. Extended operating life as closer is permanently lubricated. Visual-pack. Alum tube - steel rod, steel jamb and steel door brackets. Dsigned for use on out swinging wood or metal doors up to 1-3/8? thick. Door closing speed is fully adjustable. Two hole end plug allows closing force to be regulated. Includes convenient "hold-open" washer. Extended operating life as closer is permanently lubricated. Visual-pack. Alum tube - steel rod, steel jamb and steel door brackets. Dsigned for use on out swinging wood or metal doors up to 1-3/8? thick. Door closing speed is fully adjustable. Two hole end plug allows closing force to be regulated. Includes convenient "hold-open" washer. Extended operating life as closer is permanently lubricated. Visual-pack. Designed for wood or metal screen and storm doors 1-3/4" hole spacing. Fits wood doors from 5/8" to 2" thick. Interior locking mechanism provides for enhanced security. Mounting screws included to match product finish. Includes spring loaded strike plate. Note: for 2" thick doors, pan head machine screws 8/32" x 2-3/8" are required and must be purchased separately (qty 2). Visual-pack. Zinc die casting Colonial hammered design. Interior locking mechanism provides for enhanced security. Featuring 1-3/4 In hole spacing. Fits doors from 3/4" to 1-1/4". Strike included. Visual-pack. Set includes: 1 pair #129 hinges, 1 - #2 hook and eye, 1 - #2 pull, 1 - #76 spring with hooks, all mounting screws. Mounting options: full surface, half surface and offset applications. Holes are countersunk on both sides. Pins are removable for easy door installation. Steel hinges, hooks, eyes, and pull; steel wire spring. Set includes: 1 pair #129 hinges, 1 - #2 hook and eye, 1 - #2 pull, 1 - #76 spring with hooks, all mounting screws. Mounting options: full surface, half surface and offset applications. Holes are countersunk on both sides. The pins are removable for easy door installation. Steel hinges, hooks, eyes, and pull; steel wire spring. Visual-pack. Designed for wood or metal screen and storm doors 1-1/2? hole spacing. Fits wood doors from 5/8" to 2" thick. Note: for 2? thick doors, pan machine screws 8/32? x 2-3/8? are required and must be purchased separately (qty 2). Interior locking mechanism provides for enhanced security. Mounting screws included to match product finish. Includes spring loaded strike plate. Manufactured from zinc die-cast. 3" hole centers. Heavy-duty zinc die-cast construction. Fit 5/8'' to 2'' thick, outward swinging screen and storm doors. Resilient strike keeper. 3" hole centers. Heavy-duty zinc die-cast construction. Fit 5/8'' to 2'' thick, outward swinging screen and storm doors. Resilient strike keeper. Plastic assembly with aluminum inner housing; plastic roller; attached adjustment screw. Roller edge type; Concave, fits Andersen Doors. Designed for wood or metal screen and storm doors with either 1-1/2", 1-3/4", or 3" hole spacing. Fits wood doors from 5/8" to 1-3/8" thick. Mounting screws included to match product finish. Interior locking mechanism provides for enhanced security. Includes spring loaded strike plate. Visual-pack. Designed for wood or metal screen and storm doors with either 1-1/2", 1-3/4", or 3" hole spacing. Fits wood doors from 5/8" to 1-3/8" thick. Mounting screws included to match product finish. Interior locking mechanism provides for enhanced security. Includes spring loaded strike plate. Visual-pack. Designed for wood or metal screen and storm doors with either 1-1/2", 1-3/4", or 3" hole spacing. Fits wood doors from 5/8" to 1-3/8" thick. Mounting screws included to match product finish. Interior locking mechanism provides for enhanced security. Includes spring loaded strike plate. Visual-pack. Shock absorbing air, for wood or metal screen & storm doors & other lightweight doors, adjustable closing speed, shock absorbing spring, positive latching for wind damage prevention, with screws. Leaf spring provides a smoother, more positive action. For outswinging wood or metal doors. Full 90 degree opening. Adjustable closing speed. Factory lubricated. For outswinging wood or metal doors, full 90 degree opening, push button hold open feature, tool free adjusting screw to adjust the closing speed, factory lubricated, use alone for light & medium weight doors or with either a V920 or V1020 for heavier full view storm doors, all installation hardware included. For outswinging wood or metal doors, full 90 degree opening, push button hold open feature, tool free adjusting screw to adjust the closing speed, factory lubricated, use alone for light & medium weight doors or with either a V920 or V1020 for heavier full view storm doors, all installation hardware included. Zinc, die cast. Fits doors from 3/4" to 1-1/4". Featuring 1-3/4? hole spacing. Lift Lever action for easy opening. Includes "anti lock-out" feature. Interior locking mechanism provides for enhanced security. Strike included. Visual-pack. Surface mount - no mortising required. Pin taps out for easy door removal. Holes are countersunk on both sides. Safe working load: 45 lbs. Visual-pack. Zinc, die cast. Fits doors from 3/4" to 1-1/4". Featuring 1-3/4? hole spacing. Lift Lever action for easy opening. Includes "anti lock-out" feature. Interior locking mechanism provides for enhanced security. Strike included. Visual-pack. For out swing wood or metal doors 3/4 inch to 1-3/8 inch thick, installs in 1-1/2 inch , 1-3/4 inch or 3 inch hole spacing, all installation hardware included. Hydraulic mechanism provides smooth constant "no bounce" action. For wood or metal doors, for outswinging doors. Full 90 degree opening. Two hole end plug for summer or winter adjustable latching power. Adjustable closing speed by rotating the tube. Factory lubricated aluminum tube assembly. Hydraulic mechanism provides smooth constant "no bounce" action. For wood or metal doors, for outswinging doors. Full 90 degree opening. Two hole end plug for summer or winter adjustable latching power. Adjustable closing speed by rotating the tube. Factory lubricated aluminum tube assembly. 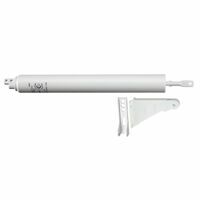 National Hardware Door Closer, Pneumatic, Series: V1337, Posi-Glide, 11-1/8 in Length, Adjustable Closing, Steel, White, 6 in Stroke, 5/16 in Rod Diameter, 1-1/4 in Tube Diameter, For Wood or Metal Screen, Storm Doors and Other Lightweight Doors Visual-pack. Visual-pack. Includes: 3 - Spring hinges, 1 - Door pull, 1 - Door knob, 1 - Hook and eye latch, Mounting screws. Designed for full surface applications. Non-removable pin hinges are with the enclosed spring for left or right mount applications. Complete kit for vinyl or wood screen doors. Knob and lever are non-operative. Visual-pack. Includes: 3 - Spring hinges, 1 - Door pull, 1 - Door knob, 1 - Hook and eye latch, Mounting screws. Designed for full surface applications. Non-removable pin hinges are with the enclosed spring for left or right mount applications. Complete kit for vinyl or wood screen doors. Knob and lever are non-operative. Visual-pack. Includes: 3 - Spring hinges, 1 - Door pull, 1 - Door knob, 1 - Hook and eye latch, Mounting screws. Designed for full surface applications. Non-removable pin hinges are with the enclosed spring for left or right mount applications. Complete kit for vinyl or wood screen doors. Knob and lever are non-operative. Visual-pack. Includes: 3 - Spring hinges, 1 - Door pull, 1 - Door knob, 1 - Hook and eye latch, Mounting screws. Designed for full surface applications. Non-removable pin hinges are with the enclosed spring for left or right mount applications. Complete kit for vinyl or wood screen doors. Knob and lever are non-operative. Visual-pack. Aluminum tube - steel rod, steel jamb and steel door brackets. Heavy duty air controlled door closer is designed for use on out swinging wood or metal doors up to 1-3/8 inch thick. Door closing speed is fully adjustable. Two hole end plug allows closing force to be regulated. Includes convenient "hold-open" washer. Extended operating life as closer is permanently lubricated. Visual-pack. Aluminum tube - steel rod, steel jamb and steel door brackets. Heavy duty air controlled door closer is designed for use on out swinging wood or metal doors up to 1-3/8 inch thick. Door closing speed is fully adjustable. Two hole end plug allows closing force to be regulated. Includes convenient "hold-open" washer. Extended operating life as closer is permanently lubricated. Visual-pack. Aluminum tube - steel rod, steel jamb and steel door brackets. Heavy duty air controlled door closer is designed for use on out swinging wood or metal doors up to 1-3/8 inch thick. Door closing speed is fully adjustable. Two hole end plug allows closing force to be regulated. Includes convenient "hold-open" washer. Extended operating life as closer is permanently lubricated. Visual-pack. Aluminum tube, steel rod. Visual-pack. Aluminum tube, steel rod. Visual-pack. Hampton Pneumatic Screen and Storm Door Closer, Series: Tap-N-Go, 2-1/4 in Length, 2-1/4 in Width, 13 in Height, 90 deg Door Opening, Aluminum, White, Includes: Installation Hardware, For Out-Swinging Wood or Metal Doors Hampton Door Closer, Heavy Duty, 2-1/4 in Length, 13 in Width, 2-1/4 in Height, 90 deg Door, Black, For Commercial/Residential, Exterior and Outswinging Wood or Metal Doors Zinc, die cast, Colonial hammered design. Fits doors from 3/4" to 1-1/4". Featuring 1-3/4? hole spacing. Dual locking design with exterior key lock-separate interior locking mechanism. Includes "anti lock-out" feature. Strike included. Visual-pack. Recommended for light and medium weight storm and screen doors. Hands free hold open button. Smooth closing motion to prevent unwanted slams to the user. Fully adjustable closing and slamming speeds. No tools required. Easily replaces old closers by fitting with existing brackets. Comes complete with all installation hardware. Visual-pack. Recommended for light and medium weight storm and screen doors. Hands free hold open button. Smooth closing motion to prevent unwanted slams to the user. Fully adjustable closing and slamming speeds. No tools required. Easily replaces old closers by fitting with existing brackets. Comes complete with all installation hardware. Visual-pack. For outswinging wood or metal doors 3/4" - 2" thick. 1-3/4" mounting hole spacing. Installs in three 5/16" holes. "No Lock Out" feature prevents accidental lock out. Contains two sizes of strike plates and shim. Zinc die cast, steel strike. Fits doors from 7/8 to 1-3/8 inches thick. Offers built-in locking device. Inside lever, outside knob. Strike included. Visual-pack. Zinc die cast, steel strike. Fits doors from 7/8 to 1-3/8 inches thick. Offers built-in locking device. Inside lever, outside knob. Strike included. Visual-pack. Set includes: 1 pair #129 hinges, 1 - #2 hook and eye, 1 - #2 pull, 1 - #76 spring with hooks, all mounting screws. Mounting options: full surface, half surface and offset applications. Holes are countersunk on both sides. The pins are removable for easy door installation. Steel hinges, hooks, eyes, and pull; steel wire spring. Visual-pack. 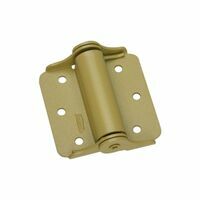 National Hardware Spring Hinge, Adjustable, Heavy Duty, Series: V123, 0.218 in Hole Diameter, 0.08 in Leaf Thickness, 3 in Door Leaf Length, 3 in Frame Leaf Length, Tight Pin, Wall Mounting, 25 lb Load Capacity, Steel, Baked Enamel Brass, BHMA A138.18, For Full Surface Application Designed for wood or metal screen and storm doors with either 1-1/2?, 1-3/4?, or 3? inch hole spacing. Fits wood doors from 5/8" to 1-3/8? thick. Dual locking design - exterior key lock-separate interior locking mechanism. Interior locking mechanism provides for enhanced security. Mounting screws included to match product finish. Includes spring loaded strike plate. Manufactured from zinc die-cast. Uses Y11 key blank N223-990 1308K. Helps prevent screen or glass damage. Molded plastic, easy to install, fits most swinging door applications. Polybagged. Helps prevent screen or glass damage. Molded plastic, easy to install, fits most swinging door applications. Polybagged. Pull to get in, push to get out. Standard installation. 1-3/4" hole centers. No lockout latch, solid strike included. For doors 1" - 2-1/8" thick Designed for wood or metal screen and storm doors 1-3/4 hole spacing. Fits wood doors from 3/4" to 2" thick. Interior locking mechanism provides for enhanced security. Mounting screws included to match product finish. Includes spring loaded strike plate. Visual-pack. Designed for wood or metal screen and storm doors 1-3/4 hole spacing. Fits wood doors from 3/4" to 2" thick. Interior locking mechanism provides for enhanced security. Mounting screws included to match product finish. Includes spring loaded strike plate. Visual-pack. Natham Door Closer, Series: V1345, Touch 'n Hold, Light/Medium Duty, 11.1 in Length, Steel, Aluminum, Includes: Mounting Brackets and Screws, 1 in Thickness For use on 5/8" to 1-3/8" doors. 1-1/2", 1-3/4" and 3" adjustable hold spacing. Includes key for locking mechanism. Visual-pack. For use on 5/8" to 1-3/8" doors. 1-1/2", 1-3/4" and 3" adjustable hold spacing. Includes key for locking mechanism. Visual-pack. Replaces most standard push buttons latches. Matching interior and exterior finishes eliminates the need to match paint colors. Includes a Night Latch with our "No Lock-Out Feature". Fits most 3/4" to 2" thick doors. 1-3/4" mounting hole spacing. Durable grilles designed to protect your door. Prevents torn screens and broken glass. Made of aluminum and will not rust or tarnish. Durable grilles designed to protect your door. Prevents torn screens and broken glass. Made of aluminum and will not rust or tarnish. Pull to get in, push to get out. Standard installation. 1-3/4" hole centers. No lockout latch, solid strike included. For doors 1" - 2-1/8" thick Castellan surface latch is surface-mount hardware with the look of mortise. Reversible levers for left and right hinged doors. Fits doors 3/4" to 1-1/4" thick. Includes built in thumb turn deadbolt. 5-1/2" mounting hole spacing. All mounting hardware included. Adjustable to provide desired closing speed for a variety of applications. Full-surface application, no mortising required. Tight pin for either right or left hand applications. Manufactured from cold-rolled steel, solid brass adjustable collar. Safe working load (SWL) 25 lbs. Durable grilles designed to protect your door. Prevents torn screens and broken glass. Made of aluminum and will not rust or tarnish. Prevents children & pets from damaging screens. Provides safety to children. Keeps hands from going through glass in storm doors. Strong extruded frame. Riveted mesh - resists being pushed out of frame. Attractive styling. Maintenance free. Screws included. Dimensions are full width including tabs. Fits doors 1-1/8" to 2" thick doors. Includes built in deadbolt. Reversible levers for left and right hinged doors. Matching interior and exterior finishes eliminates the need to match paint colors. Includes adjustable backset for either 3/4" or 1" backsets. Durable grilles designed to protect your door. Prevents torn screens and broken glass. Made of aluminum and will not rust or tarnish. Replaces most storm door latches with 1-3/4 inch hole spacing. Fits most doors 3/4 inch to 2 inch thick. Features deluxe wide push paddle inside handle with night lock feature. Contains an inside escutcheon plate to hide any unwanted installation holes in your door. All installation hardware included. Castellan surface latch is surface-mount hardware with the look of mortise. Reversible levers for left and right hinged doors. Fits doors 3/4" to 1-1/4" thick. Includes built in thumb turn deadbolt. 5-1/2" mounting hole spacing. All mounting hardware included. Durable grilles designed to protect your door. Prevents torn screens and broken glass. Made of aluminum and will not rust or tarnish. Durable grilles designed to protect your door. Prevents torn screens and broken glass. Made of aluminum and will not rust or tarnish. Replaces most storm door latches with 1-3/4 inch hole spacing. Fits most doors 3/4 inch to 2 inch thick. Features deluxe wide push paddle inside handle with night lock feature. Contains an inside escutcheon plate to hide any unwanted installation holes in your door. All installation hardware included. For outswinging wood or metal doors 3/4" - 2" thick. 1-3/4" mounting hole spacing. Replaces most standard push button latches. Matching interior and exterior finishes eliminates the need to match paint colors. Fits doors 1-1/8" to 2" thick doors. Includes built in deadbolt. Reversible levers for left and right hinged doors. Matching interior and exterior finishes eliminates the need to match paint colors. Includes adjustable backset for either 3/4" or 1" backsets. Durable grilles designed to protect your door. Prevents torn screens and broken glass. Made of aluminum and will not rust or tarnish. For outswinging wood or metal doors 3/4" - 2" thick. 1-3/4" mounting hole spacing. Replaces most standard push button latches. Matching interior and exterior finishes eliminates the need to match paint colors. Durable grilles designed to protect your door. Prevents torn screens and broken glass. Made of aluminum and will not rust or tarnish. Durable grilles designed to protect your door. Prevents torn screens and broken glass. Made of aluminum and will not rust or tarnish.